Hollywood, CA – January 29th, 2014 – Award-winning short film ‘Prisoner 614’ starring Hemky Madera (‘Weeds’) and Celestin Cornielle (‘Agents of S.H.I.E.L.D’), which is currently enjoying a successful festival run, is set to screen on February 12th at the Hollywood Reel Independent Film Festival (www.hollywoodreelindependentfilmfestival.com) being held February 11th – 23rd at the New Beverly Cinema in Hollywood. The thriller was written, directed and produced by David Portorreal, whose father was born and raised in the Dominican Republic during the reign of the dictator Rafael Leonidas Trujillo Molina, and was the inspiration for Portorreal’s award-winning film. 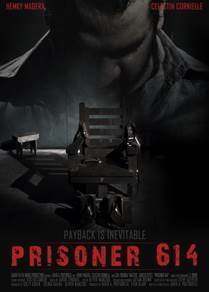 ‘Prisoner 614’ is a short intense drama thriller about an off-kilter prisoner (Hemky Madera) who is brought before a determined military interrogator (Celestin Cornielle), unafraid of using violent methods for information. Things begin to heat up when one of them soon realizes that he got more than what he bargained for. ‘Prisoner 614’, which is a film festival ‘must see’, was an official selection at the Los Angeles International Underground Film Festival and won during its Premiere at the Festival de Cine Global Dominicano. Audiences can see ‘Prisoner 614’, and meet some of the key cast, on February 12th at 3:30pm at the New Beverly Cinema, 7165 West Beverly Boulevard in Hollywood, CA 90036. Portorreal’s next film, currently in development with a Federal agent, is ‘Maite’, which is set for production in the Dominican Republic later this year.